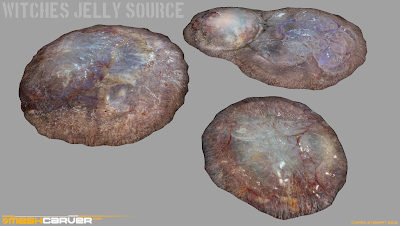 Here's another update, this time focusing on one of the Anomalies, the deadly Witches Jelly. This one's a bit of a risk, but in trying to stick to Roadside Picnic and it's environment I have to adapt some of the ideas for the ARMA3 island. For this, I've gone down the route of introducing a bit more of the horror side of STALKER into the design. A few reasons for this, but primarily is because there aren't that many islands/themes in ARMA addons upto now that have this (As far as I know), and also it really fits the STALKER universe so I'll try to play on it in subtle ways that will effect your game play. Anyway, these little beauties will be growing in basements, swamps and dark recesses of old irradiated factories and laboratories etc, and will give off a glow that can be seen for quite some distance away. They will be surrounded by a glowing miasma of gases which they expel, hissing and spluttering, completely harmful and fatal if exposed to for longer than say, 10-20 seconds... So you know to stay well away. That being said, you won't really be able to walk up to these and study them for that reason- you'll have to give them a wide berth and study them from afar. Ideally I want them to be breathing/pulsing slightly and slowly in the final build, as to give them a sense of life, like a tumorous parasite that should add to the feeling of repulsion hopefully.